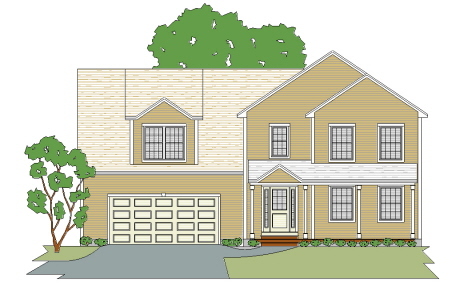 This 3 bedroom modern colonial home plan with a 2 car garage will work wonderfully for most young families. The open concept makes the first floor feel bigger than it actually is, and the second floor makes exceptional use of it's small footprint. 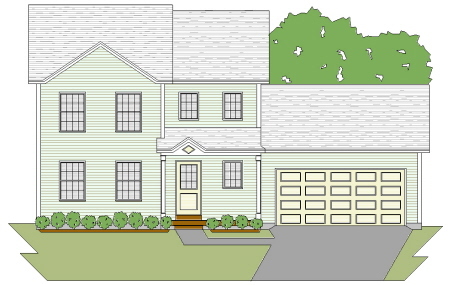 This 3 bedroom modern colonial home plan has plenty of curb appeal. Just the right size for a family starting out. The semi-open concept first floor has large rooms for it's compact size. The second floor also has 3 comfortable bedrooms and 2 bathrooms. The garage can be enlarged if you wish. 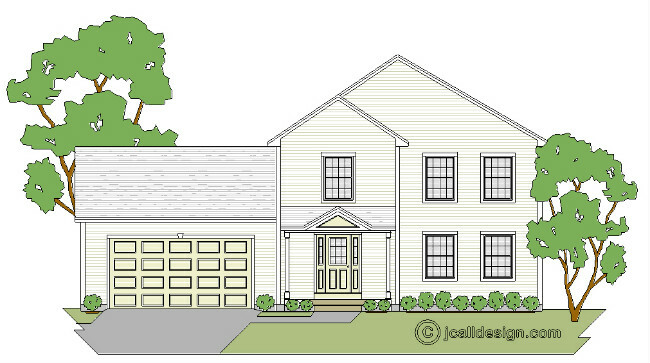 This 3 bedroom modern colonial home plan is the same plan as the Standish A with a larger garage. It has plenty of curb appeal. Just the right size for a family starting out. The semi-open concept first floor has large rooms for it's compact size. The second floor also has 3 comfortable bedrooms and 2 bathrooms. 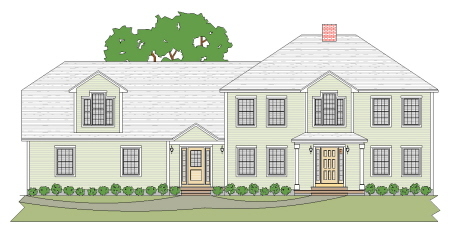 The farmer's porch and bump-out add curb appeal to this 3 bedroom modern colonial home plan. It features a first floor with great traffic flow and an upstairs with very comfortably sized bedrooms for its size. 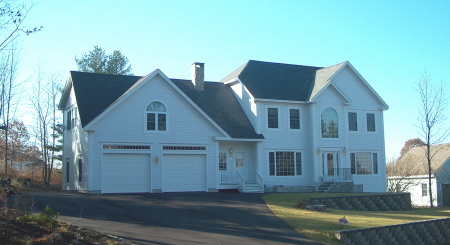 The two car attached garage also has an entry door, great for anyone coming inside on a Maine winter's day. 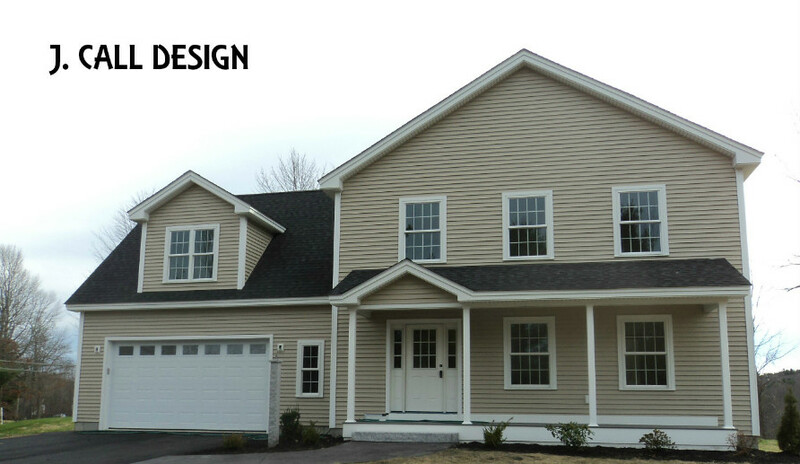 This front gabled 3 bedroom modern colonial home plan with a front porch proves that a a floor plan be anything but average. 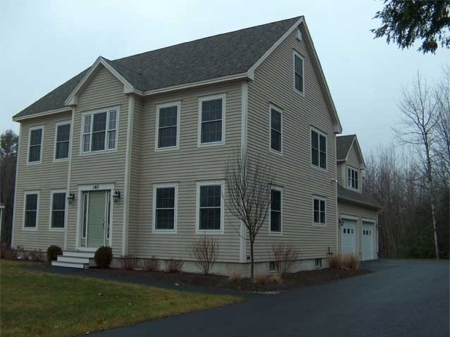 This home features an entry foyer, a kitchen with breakfast nook and a separate dining area. The fireplace in the living room will add warmth on a New England winter's night. A two car garage and breezeway complete the first floor. 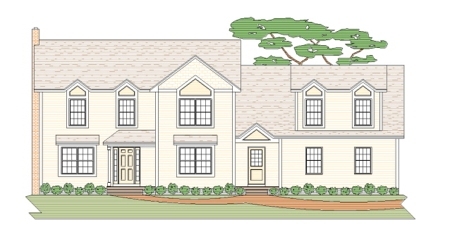 The upstairs features comfortable bedrooms and a master bath with a large walk-in closet. 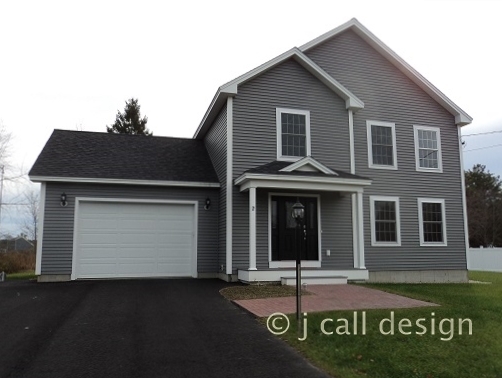 This beautiful contemporary 3 bedroom modern colonial home plan looks great. The covered porch entries over the doors keep away winter rain and snow. The bay area breakfast nook is the perfect place to enjoy the view while having morning coffee. The second floor has 3 decent sized bedrooms and 2 bathrooms. 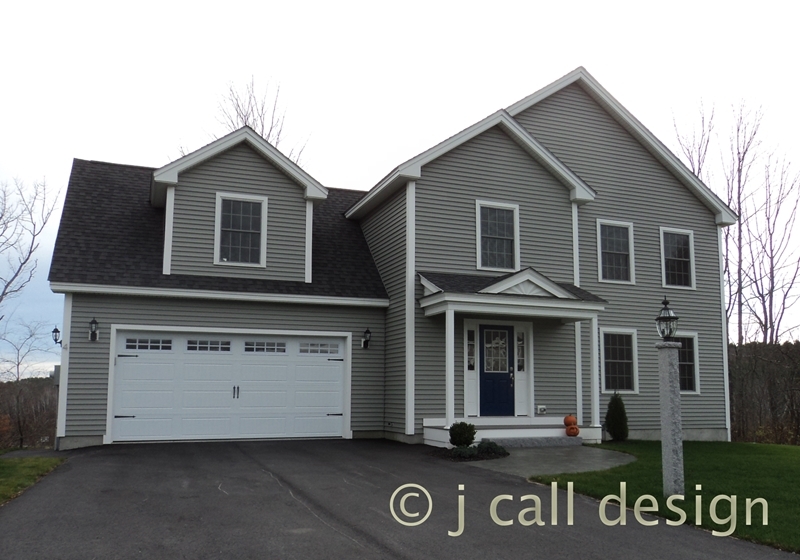 It also offers a side entry garage which keeps the garage doors away from the front of the house, something many people find more architecturally pleasing. 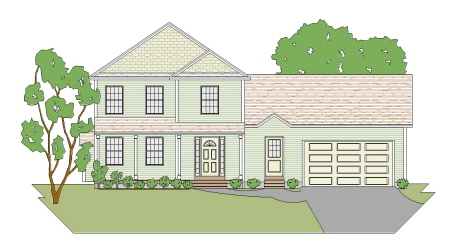 This nice looking 3 bedroom modern colonial home plan with a front porch and 2 car garage will fit right in on a cul-de-sac anywhere in New England. It's open concept living area, formal dining area, and great second floor bedroom plan make this house a popular choice. 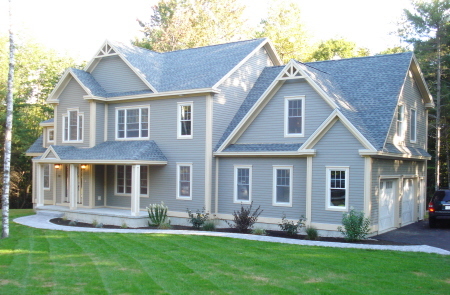 This is one of our favorite front gable 3 bedroom modern colonial home plans. 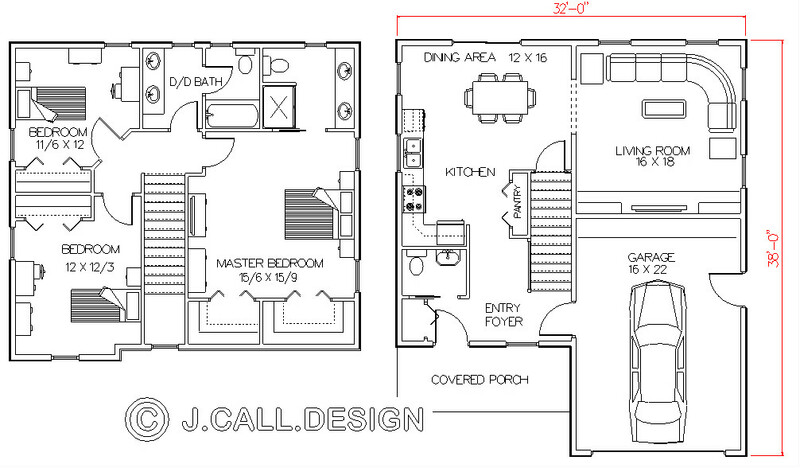 Affordable to build, this unique floor plan works for family living. 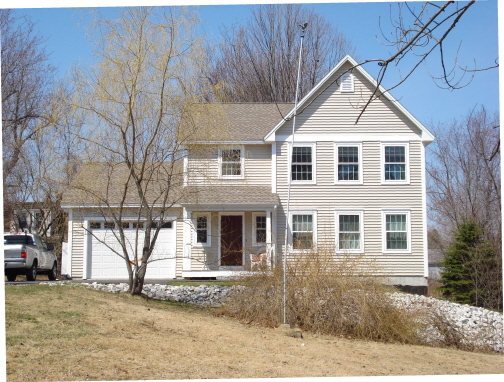 The front porch adds curb appeal and the 2 car garage with a cellar entry eliminates the need for a messy bulkhead. 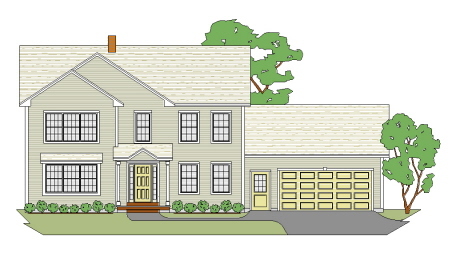 This 3 bedroom modern colonial home plan with a porch and a 2 car garage is the same plan as the Standish B with a future recreation room above the garage. 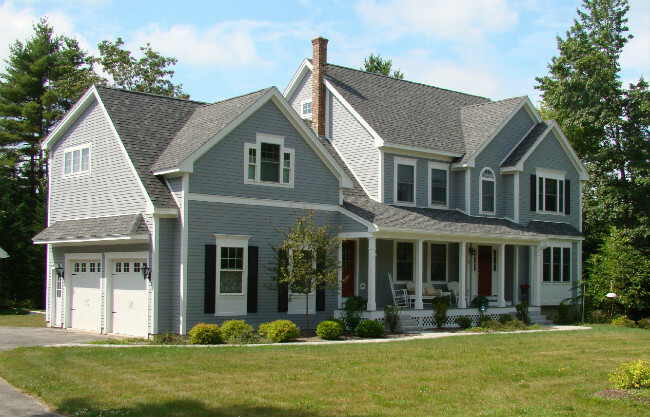 It has plenty of curb appeal and it's just the right size for a young family. The semi-open concept first floor has large rooms for it's compact size. The second floor also has 3 comfortable bedrooms and 2 bathrooms. 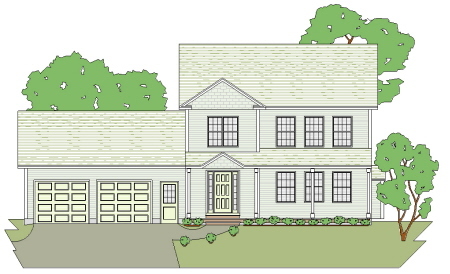 This modern 3 bedroom colonial home plan with a porch and two car garage is just the right size for the average family. It features open concept living on the fist floor. 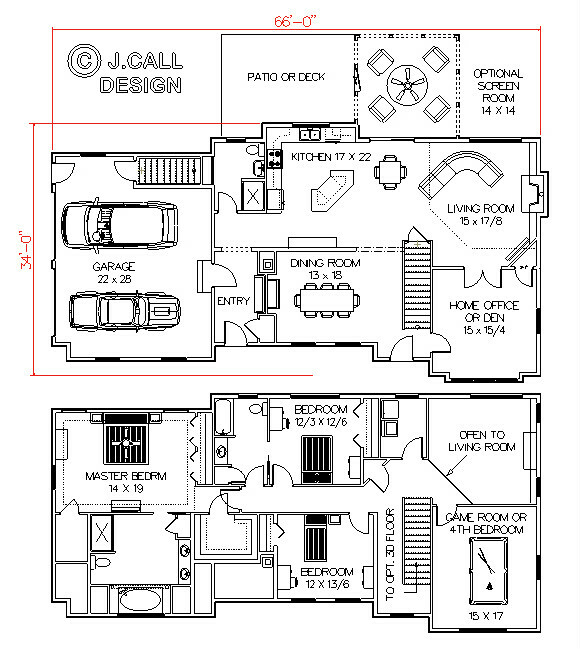 The upstairs has a great floor plan featuring a large master bedroom suite with a great bath, and two kid's rooms that share a double duty bathroom. 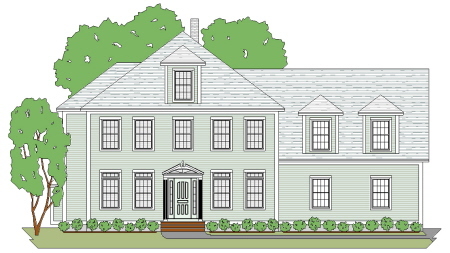 This beautiful Maine modern colonial home plan and design has it all. 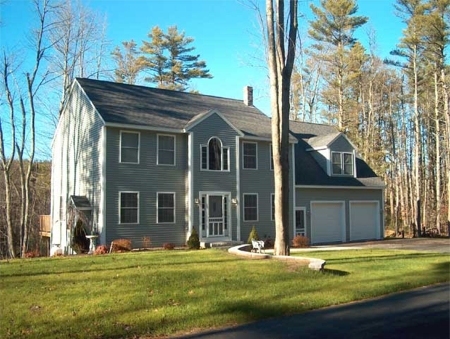 The first floor boasts open concept living and a den or dining room, while the upstairs has 2 large kids rooms which share a double duty, and the master suite has a large closet and nice bath. The garage has side entry doors and an inside entrance to the basement eliminating the cumbersome bulkhead. 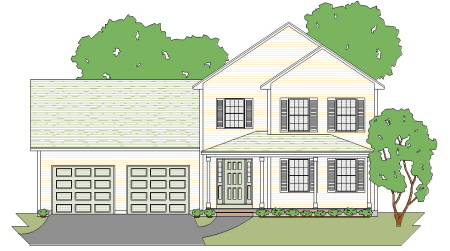 This 3 bedroom modern colonial home plan with a porch and a 2 car garage is the same plan as the Standish C with a larger garage and a larger future recreation room above the garage. 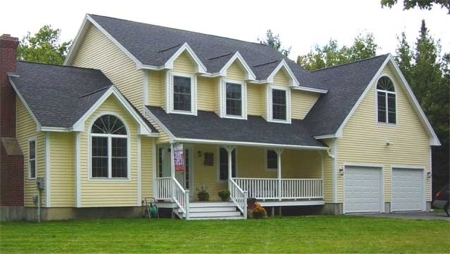 It has plenty of curb appeal and it's just the right size for a young family. 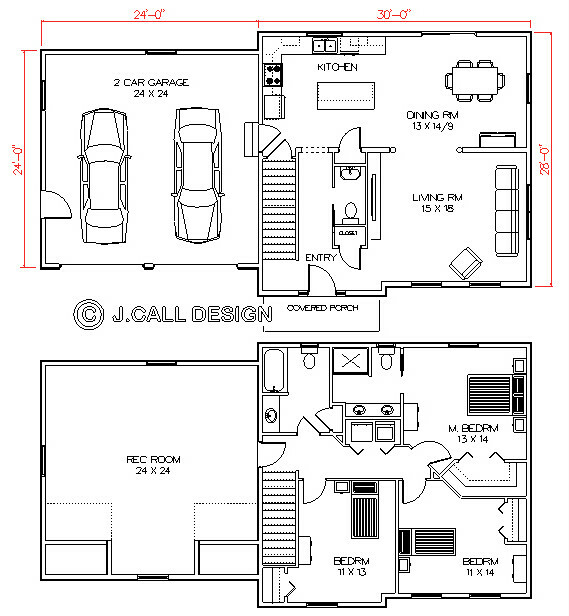 The semi-open concept first floor has large rooms for it's compact size. The second floor also has 3 comfortable bedrooms and 2 bathrooms. 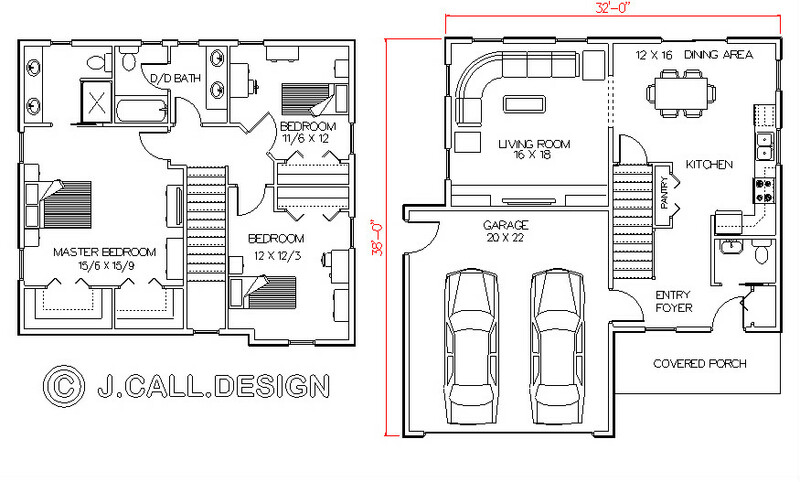 This plan is also available with double garage doors. 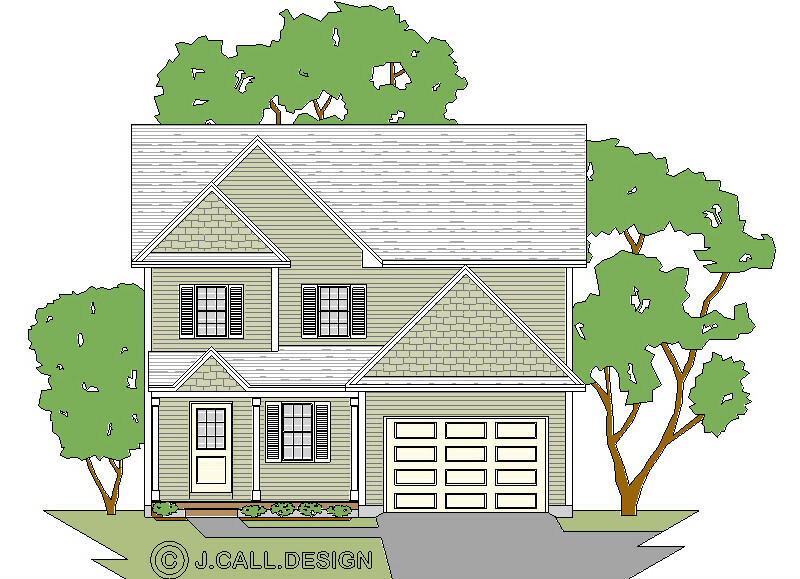 The architectural design of this modern 3 bedroom colonial home plan has a great "family living" floor plan. Upstairs has decent sized rooms and a recreation room as well. 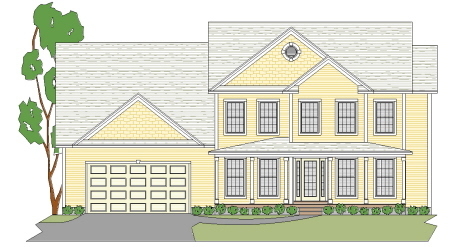 The front porch and double dormers on the 2 car garage adds to the curb appeal. 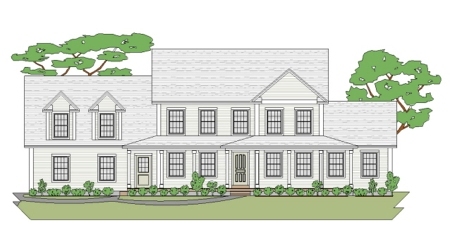 The wrap around porch on this 3 bedroom modern colonial home plan gives it a New England Farmhouse flair.This plan offers open concept living downstairs with a home office or formal dining room, and comfortable kids rooms and a nice master suite upstairs. The side entry garage has an entry to the basement which makes it more easily accessible than a bulkhead. 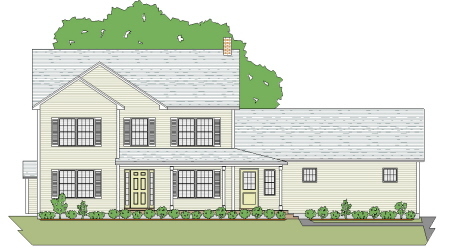 This 3 bedroom modern colonial home plan appears small on the outside, but that's not the case inside. With an open concept kitchen, breakfast and dining area, and a large living room it feels large. 3 bedrooms up and a large rec room also add to the feeling of space. The two car garage is a welcome addition too. 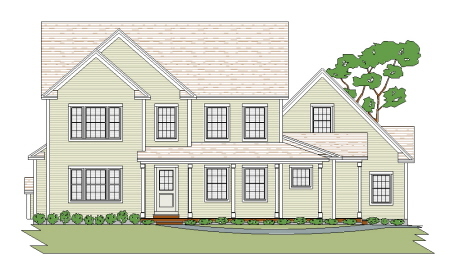 This beautiful modern colonial style 3 bedroom two story home plan has more than enough amenities for the couple looking for a bit larger, yet affordable to build home. The first floor has a nice entry foyer, a 1/2 bath, a comfortably sized living room with a fireplace, and a large country styled kitchen/dining area. 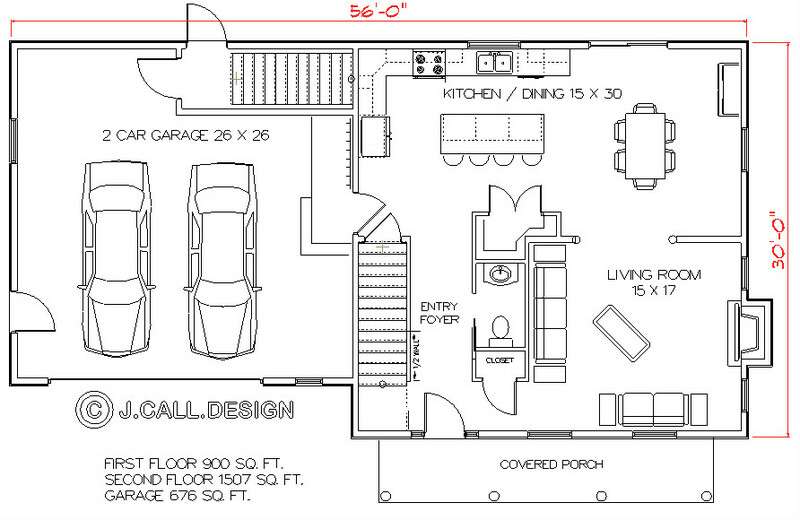 The 26x26 garage offers easy access to the full basement, and a coat and boot area at the entry to the kitchen. 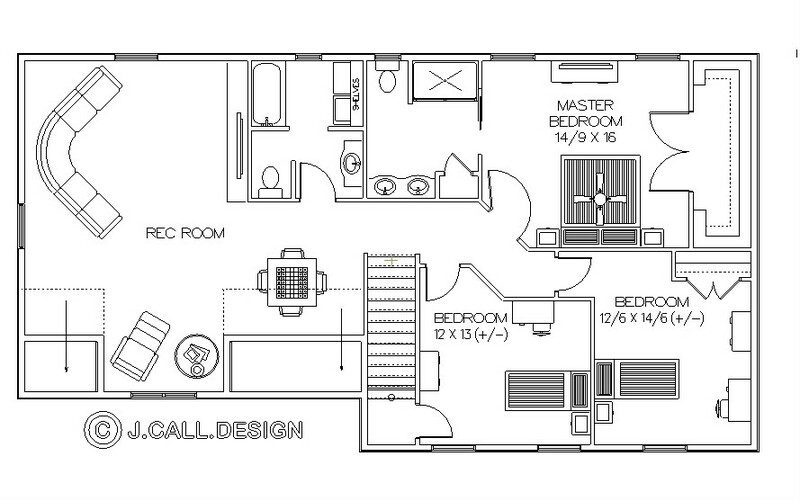 The second floor has a rec room or man cave; two very good size kids rooms; and a common bath and a laundry area. The master suite is large enough for a king bed. 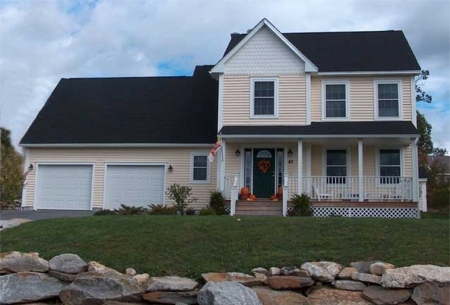 All in all, this home is a great dollar value for parents with teenage children. 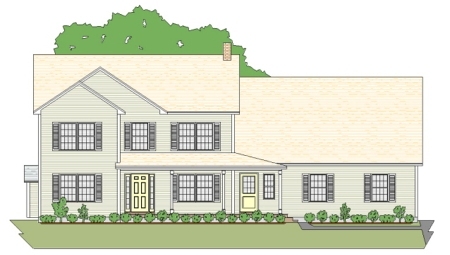 This 3 bedroom modern colonial house plan feels a lot bigger than it looks thanks to the large country kitchen and large living room which share a double sided fireplace between them. Upstairs the 3 large bedrooms, two baths, a laundry, and a recreation room also add to the feeling of spaciousness. The front porch and side load garage is also a nice feature. 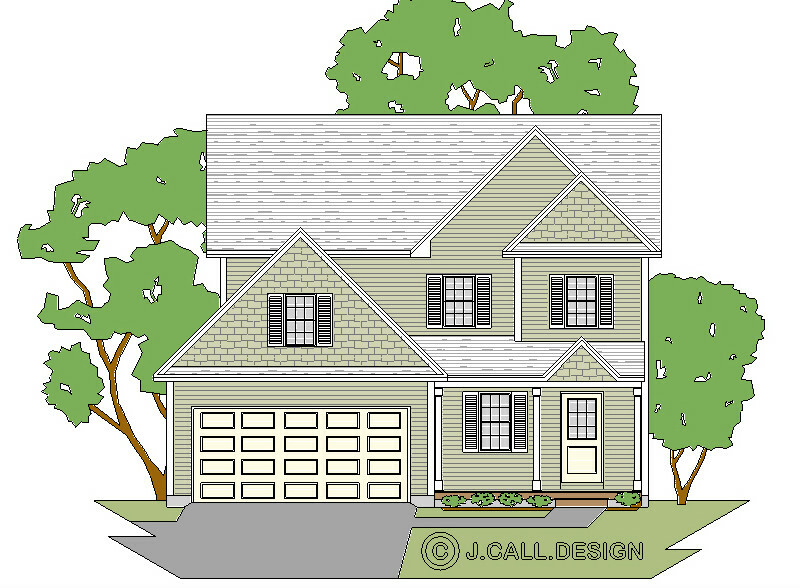 This is another 3 bedroom modern colonial home plan that looks smaller than it actually is. 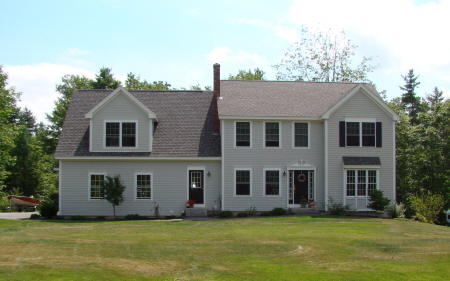 It has a large country kitchen and large living room on the first floor. The second floor has decent size kids rooms which share a bathroom, a large master suite , and a large recreation room. The front porch and the 2 car garage finish it off. 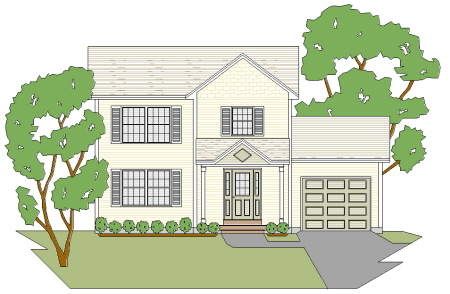 You'll have curb appeal to the max with this 3 bedroom modern colonial home plan, not to mention one of the best laid out floor plans around. A beautiful formal foyer, open concept living area with a two story living room, a formal dining room and a beautiful master suite showcase the first floor. 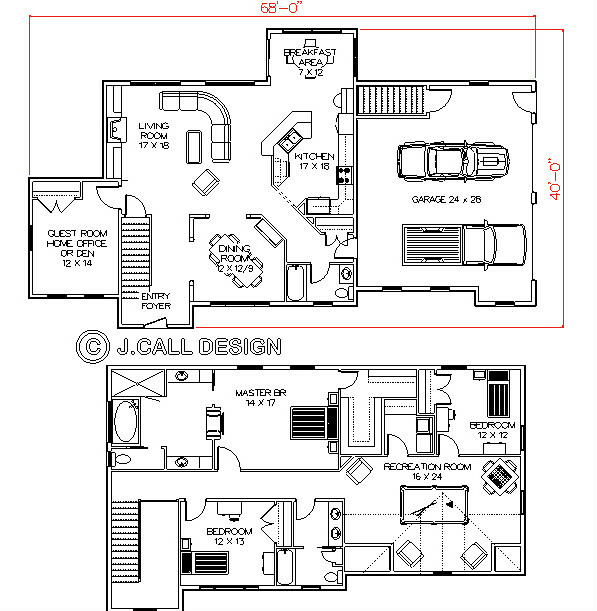 The second floor has 2 large kids rooms a recreation room, and a look over into the living room below. A 2 car garage tops it off with a side entry to the cellar. 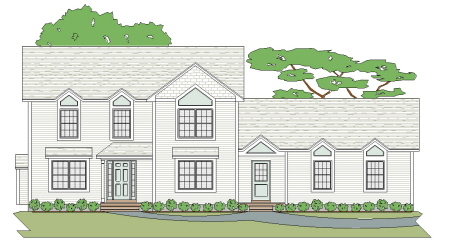 This hip roof 3 bedroom colonial home plan is modern in every way. 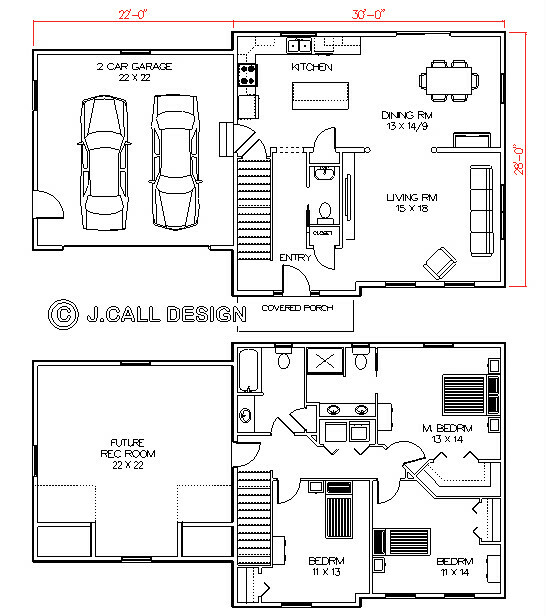 Check out the spacious first floor open concept living area with the fireplace, the formal dining room and living room. The second floor lacks nothing with large bedrooms and a double duty bath for the kids, a luxurious master suite and a large recreation room or man cave. The 2 car garage finishes it off. 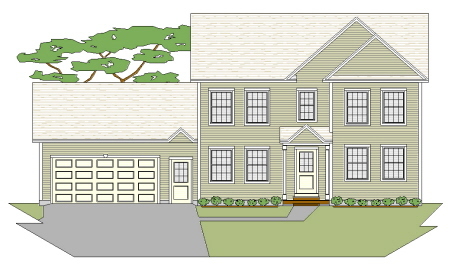 This 3 bedroom modern colonial home plan has the same exterior and first floor plan as the Charlston above. 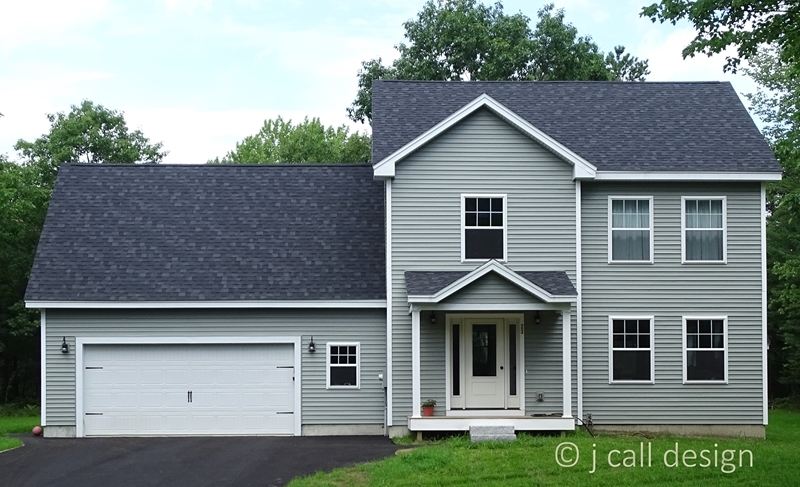 The second floor has a different master suite and a large recreation room or man cave over the 2 car garage below.The kids bedrooms and baths are just roomy as the Charlston's. 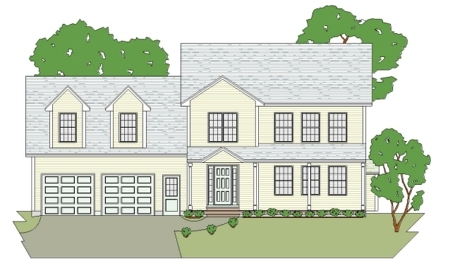 This absolutely beautiful 3 bedroom modern colonial home plan shouts out its amenities. 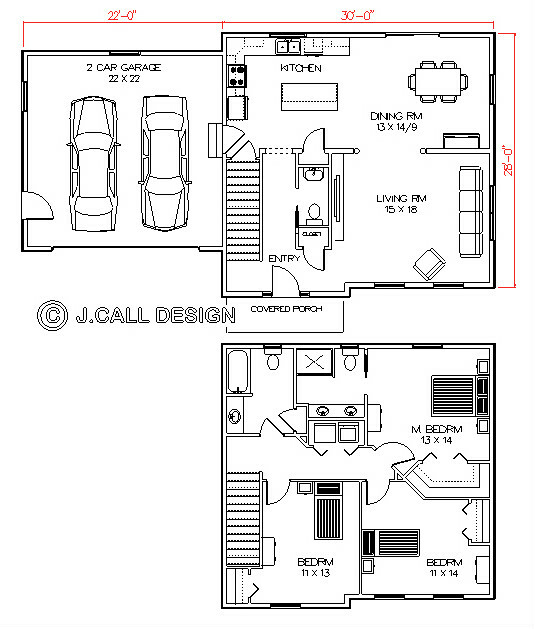 The first floor has open concept living, with a breakfast bay and a dining room with a tray ceiling. The second floor has room to spare even in spite of the 2 large kids rooms and the gigantic master suite, that is all about private time. 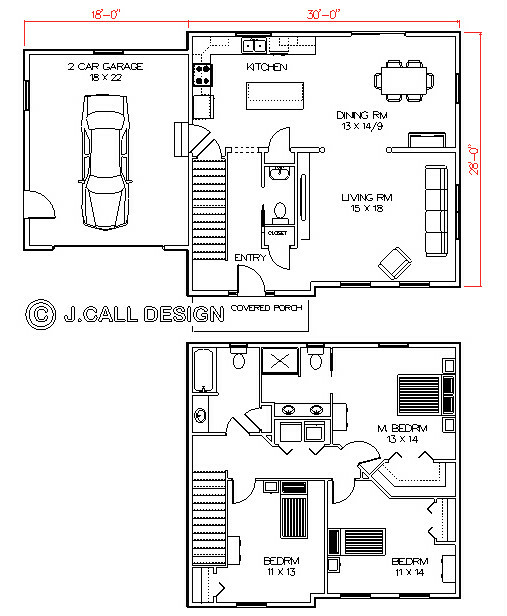 The large 2 car garage easily fits 3 cars and has access to the full basement. 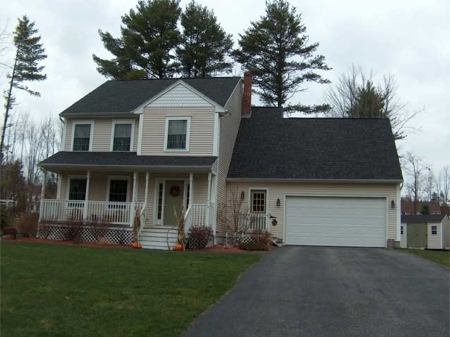 What can I say but check this 3 bedroom modern colonial out. It has open concept living on the first floor with a 2 story living room, a country kitchen, home office, formal dining and an optional screen room or sun room. The 2nd floor has 3 or 4 large kids rooms and a master suite to rival a high class motel suite. The 2 car garage has easy access to the basement. Can't you picture it on your lot? 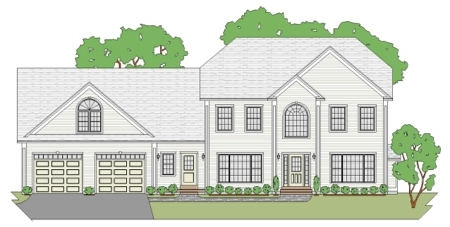 This 3 bedroom modern colonial home plan features open concept living, a den or home office, a large living room with fireplace, and formal dining on the first floor. 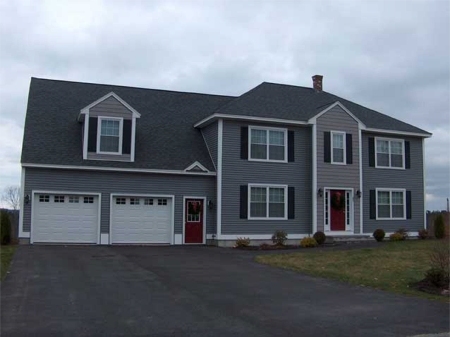 The second floor has two larger than average kids rooms, a great master suite and an oversize recreation room. 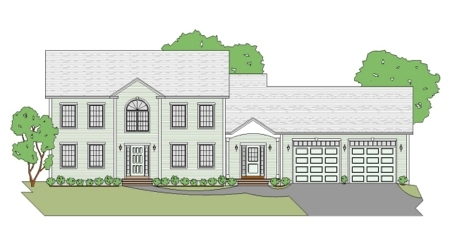 The large 2 car garage has our signature entry to the full basement. 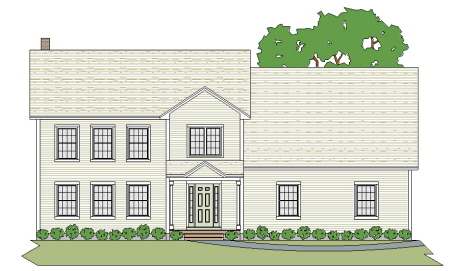 This large colonial 3 bedroom narrow lot home plan actually will fit on most narrow lots. A country kitchen, with a fireplace a formal living room, formal dining and a nice entry breezeway take up the first floor. 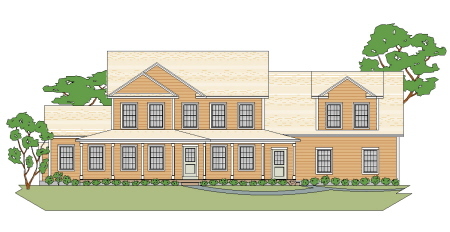 The second floor has 2 large bedrooms and a double duty bathroom for the kids, a great master suite, a laundry. and a recreation room over the large 2 car garage.